Fragrant complex aromas of cassis, black cherry, herbs and cedar.. This is a medium bodied wine with ripe warm flavours of black fruit and spice. The tannins are supple providing a fine structure and lingering finish.. Drink now or suitable for cellaring up to 8 years.. Growing conditions: Growing season 2014 got off to a great start. Settled warm weather patterns throughout spring provided optimal flowering conditions and resulted in an even and abundant fruit set across all varieties. December and January recorded slightly cooler than usual temperatures with about average rainfall allowing strong canopy growth. Cyclone Lusi was a feature of March bringing a brief period of high winds, but fortunately very little rain. Both February and March were warm and dry allowing good ripening and flavor development. 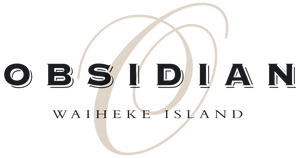 Harvest at Obsidian concluded 12th April. The smallest batches were fermented in open top fermenters with twice daily plunging. Larger parcels were fermented in closed top tanks and pumped over. Once primary fermentation was complete all batches were pressed to tank and allowed to settle prior to undergoing malolactic fermentation in French Barriques. 20% new oak.